More than a century before anyone had ever heard of Soho or Noho, Broadway just north of Houston Street was a bustling business district and slightly low-rent entertainment area with the massive Broadway Central Hotel across the street and one block up. Just look at the shops and venues: a publisher, a banner painter, and a company dealing in straw goods—plus the New York Museum of Anatomy, Science & Art at number 618 and the Olympic Theater at number 624. 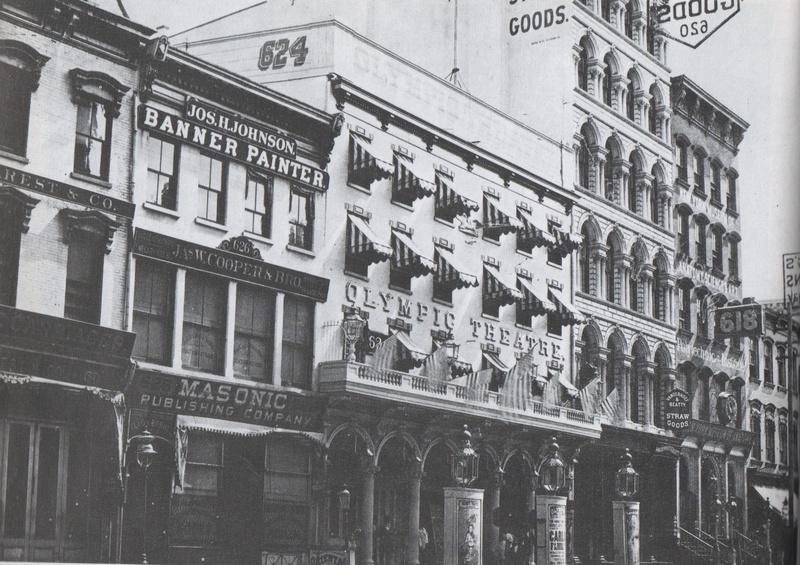 The Olympic opened in 1856 and was soon renamed Laura Keene’s New Theatre, after the actress of the era (who starred in “Our American Cousin” at Ford’s Theater in Washington the night President Lincoln was shot). The theater with its lovely lampposts went through more name changes before closing in 1880; the building burned down in 1881, explains the caption to this photo, from New York Then and Now. 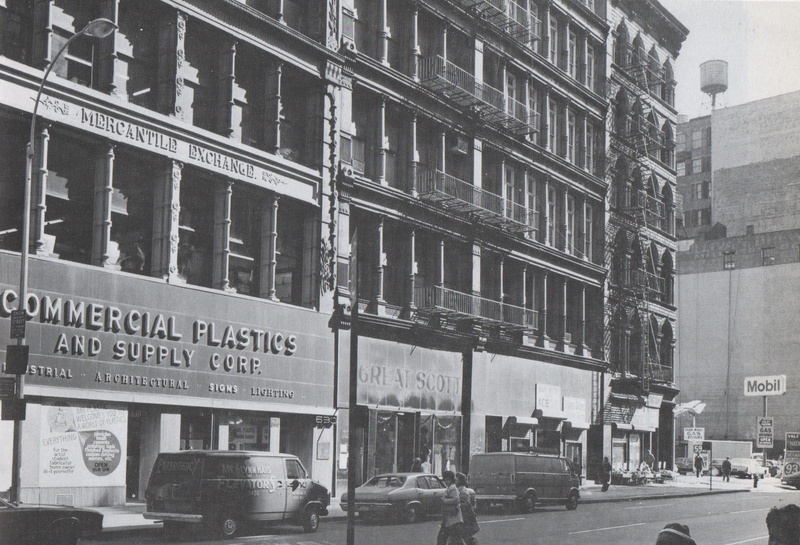 One hundred years later, the East Side of Broadway was kind of sketchy, a sparsely populated area with fabric and supply stores. But look at the new cast-iron buildings from the late 19th century, like the beautiful Mercantile Building. One structure from 1875 remains: it’s at the end before the Mobil Station. Now, the Mobil Station has been replaced by the giant Adidas Store at the corner. 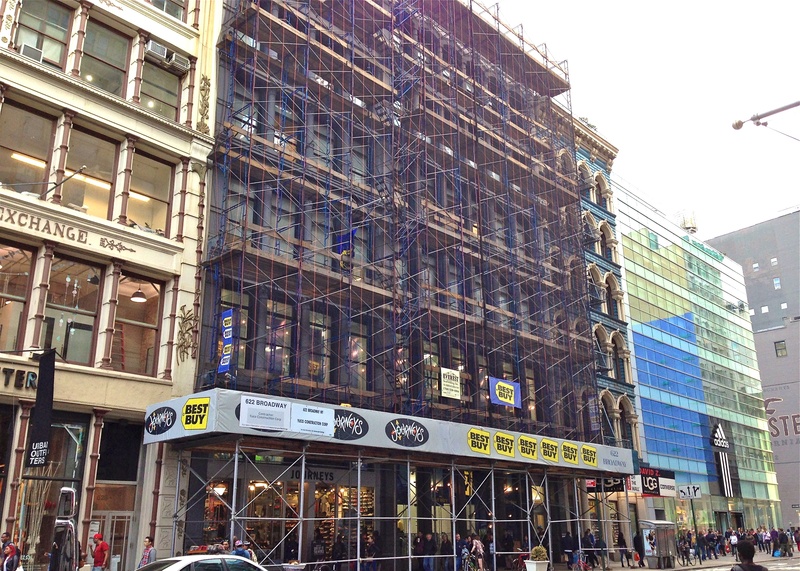 Best Buy is renovating another cast-iron beauty, and Urban Outfitters occupies the ground floor of the Mercantile Building. And this slip of Noho has been a prime shopping area since the 1980s. This entry was posted on May 3, 2014 at 5:10 am and is filed under Fashion and shopping, Music, art, theater, Random signage, Sketchy hotels, SoHo. You can follow any responses to this entry through the RSS 2.0 feed. You can leave a response, or trackback from your own site.